The CHI Play 2017 organizers are proud to announce prof. Katherine Isbister as a keynote speaker. Katherine has recently joined the Department of Computational Media at the University of California, Santa Cruz, where she is full professor and a core faculty member in the Center for Games and Playable Media. Before that, she was affiliated with the New York University where she was - among other appointments - founding Research Director of the Game Innovation Lab. With a research focus that comprises Human Computer Interaction and Game Design, Katherine Isbister and her colleagues build and research playful computer-supported experiences that push the boundaries of moment-to-moment engagement with technology. Her latest work, How Games Move Us: Emotion by Design, addresses how games may create empathy and other strong, positive emotional experiences. Katherine Isbister has also published Game Usability: Advancing the Player Experience, a seminal text about conducting user research that is specifically tailored to playful interactions, and Better Game Characters by Design, an inquiry on how understand and optimize the perception of video game characters. 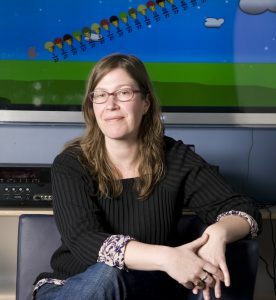 Throughout her work, Katherine has argued how games may provide insights for shaping the future of digital technologies, be a useful vehicle to generate prototypes addressing a variety of users and context, and emphasize moment-to-moment engagements, aesthetics, and emotional outcomes. Prof. Katherine Isbister will deliver the conclusive keynote for CHI Play 2017.